We are a leading Wholesale Distributor of thermal hygrometer, cooking oil tester, humidity and temperature measuring instrument testo-605-h1, wood material moisture measuring instrument, humidity and temperature measuring instrument testo-610 and material moisture measuring instrument from Pune, India. 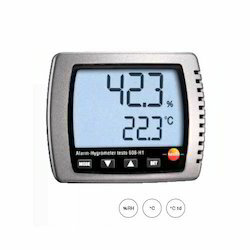 The low-budget hygrometer testo 608-H1 continuously measures humidity, temperature and dewpoint. The large display is easily legible even at a distance, the suspension and standing fixtures allow flexible positioning on a table or the wall. testo 608 has a max./min. value display and a battery monitor. Thanks to the long-term stable sensor, you can rely on correct measurement results even after years.testo 608-H2, the precise alarm hygrometer, reliably reports humidity and temperature limit value violations, e.g. in garden centres, storerooms, cleanrooms, museums, laboratories etc. 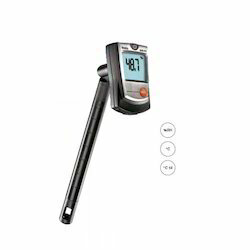 The testo 270 is a portable measuring instrument for determining the quality and temperature of cooking oil. Thanks to a capacitive sensor at the end of the probe shaft, the polar components in cooking oil are recorded, allowing direct conclusions to be drawn about the degree to which the oil is used up, and thus the quality. Since the testo 270 can be used directly in the deep-fryer, it is extremely quick and provides the measurement results within 20 seconds. Thanks to its user-friendly 3-button operation, its alarm function, its Auto-hold property and its simple operation, it allows easy and reliable use. With the help of the TopSafe, a transparent plastic cover, the measuring instrument is excellently protected from impact and dirt, and guarantees optimum hygienic conditions. This, added to its high level of accuracy and reproduceability, means the testo 270 provides completely secure measurement results. The thermal hygrometer testo 605-H1 is particularly versatile and convenient to use thanks to its joint. The display can be rotated into different positions, allowing optimum read-out of the measurement values. The long-term stable sensor guarantees correct measurement results even after years. 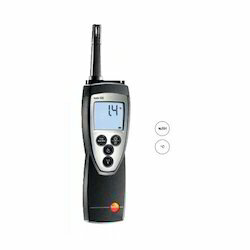 The small, compact testo 605-H1 measures air humidity and air temperature and additionally calculates the dewpoint temeprature. testo 605-H1 is suitable for monitoring air humidity in ducts. The probe shaft has a length of 125 mm and can be ideally positioned in the duct using the holder included in delivery. The rotatable protective cap protects the sensor from dirt and impact. 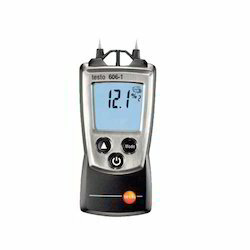 The testo 606-1/-2 is a particularly convenient and easy-tooperate pocket-sized material moisture measuring instrument. The material moisture is directly displayed in percentage by weight via stored material characteristic curves. For the measurement of wood moisture, characteristic curves are available for beech, spruce, larch, oak, pine and maple. In order to locate wet spots in building materials, curves are additionally stored for cement screed, plaster, anhydrite screed, cement mortar, lime mortar, and brick.The testo 606-2 measures air humidity and temperature in addition to material moisture. This enables drying conditions to be determined quickly and reliably on site, for example. 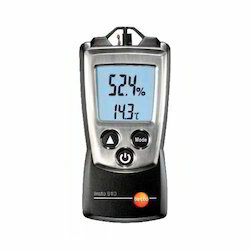 The testo 610 simultaneously measures relative air humidity and temperature. It is thus ideally suitable for fast checks on ambient conditions, e.g. in offices, production rooms or in warehouses. The patented humidity sensor developed by Testo guarantees reliable measurement resulty. The accuracy of ±2.5 %RH is confirmed by a calibration protocol which is included in delivery. Dewpoint calculation and thecalculation of Wet Bulb as well as a hold-function and the display of max. and min. values are possible with the testo 610. The clip-on protective cap, wrist strap and belt holder ensure safekeeping of the instrument. testo 610 is very handy, small and easy to operate. The test 616 allows fast and damage-free examination of material moisture curves in building materials and woods. It also facilitates your work in observing the drying process of floors walls and surfaces. For especially fast and easy handling, characteristic curves are stored for anhydrite screed, cement screed, lime sand brick, aerated concrete, concrete, vertical hole brick and solid brick for detecting wet spots in building materials. For the measurement of wood moisture, characteristic curves are available for soft woods, hard woods and chipboard. These characteristic curves were developed in cooperation with the LPI institute. The measurement results are recorded to a depth of up to 5 cm and can be frozen at the press of a button. The display is in percentage by weight related to the dry mass of the material. The testo 616 also reliably supports you in the determination of the point in time and the place for any necessary destructive measurements. In addition to temperature and humidity, the testo 622 also measures pressure, making it ideal for indoor climate monitoring. It shows the current measurement values as well as date and time in a large, clear display. It thus provides all important values at a glance. Especially in laboratories, the testo 622 is suitable for monitoring ambient conditions during calibrations or when setting up experiments. Thanks to the long-term stable sensor, the measuring instrument provides reliable and correct measurement results even after years. The hanging and standing bracket allows flexible positioning of the instrument on a table or wall. 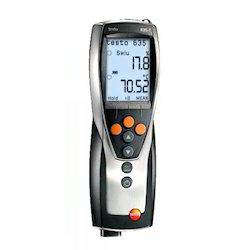 The temperature and humidity measuring instrument testo 623 shows current and past temperature and humidity values as well as date and time, simultaneously in a large, clear display. This way, you have all important values constantly in view. The displayed curve analysis offers optimum evaluation of the measurement results of the past 90 days. The testo 623 is thus ideal for fast on-site checks of ambient conditions without complicated analysis on a PC.Thanks to the long-term stable sensor, the measuring instrument provides reliable and correct measurement results even after years. The hanging and standing bracket allows flexible positioning of the instrument on a table or wall. The testo 625 is a compact instrument with an integrated humidity probe head for the measurement of air humidity and temperature. 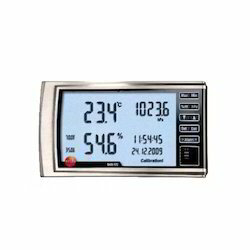 The large two-line display quickly and reliably shows humidity, Wet Bulb temperature or dewpoint, as well as temperature. probe head can simply be removed and plugged onto the handle with a probe cable (accessory); alternatively, the measurement values can be transferred wirelesly from the probe to the measuring instrument over large distances. 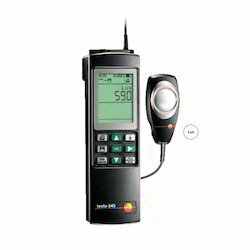 For this purpose, the humidity probe head is plugged onto the wireless handle (accessory), and the testo 625 is equipped with the radio module (accessory). The testo 635 offers the possibility of testing and analyzing air humidity, material moisture, U-value and the dewpoint in compressed air systems. In addition to measurement with classical probes, a wireless measurement over up to 20 m distance is also possible with the testo 635. This eliminates damage to the cable or difficulties in handling.The wireless probes are available for the measurement parameters temperature and humidity, up to three wireless probes can be recorded and displayed by the testo 635. The optional plug-in radio module can be retrofitted at any time. The testo 635 stands out thanks to its intuitive operation and clear menu structure. For example, for measurements at different measurement sites, the testo 635-2 provides the advantage that the measurement values can be allocated to the respective measurement site. For long-term measurements and material moisture measurements, the instrument can be switched between different user profiles. 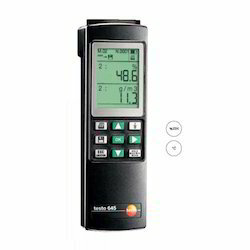 The testo 635 is available in two versions. 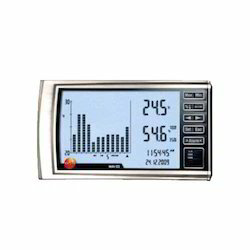 The version testo 635-2 has extended instument functions such as an instrument store, PC software, direct display of material humidity and the possibility of connecting a U-value probe. 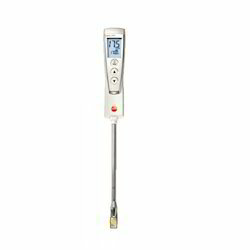 The highly accurate thermal hygrometer testo 645 has two probe inputs for the connection of an extensive range of probes: - Channel 1: temperature Type K/J/S, NTC - Channel 2: combi probe humidity/temperature or temperature probe Pt 100 The measuring instrument automatically displays the measurement parameters temperature, relative humidity, dewpoint, pressure dewpoint, absolute humidity, degree of humidity and enthalpy, and additionally presents the current values, the last measured values, min., max. and mean values at the press of a button. Measurement data can be stored by measurement site in the testo 645, and analyzed on a PC, or documented using the Testo fast printer (option). The TopSafe (option) is available for tough applications. The measuring instrument, probes and accessories can be stored safely and tidily in the transport case (option). The sensor in the testo 540 is adapted to the spectral sensitivity of the eye. This makes the testo 540 ideally suited to the measurement of light intensity at workplaces. The hold-function allows the comfortable readout of the measurement values. Max. and min. values are displayed at the press of a button. The clip-on protective cap, wrist strap and belt holder ensure safekeeping of the instrument. 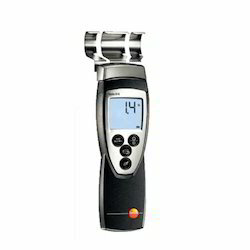 testo 540 is very handy, small and easy to operate. In order for light to be good light, the light intensity at workplaces, in hospitals, offices or schools must meet certain minimum values. testo 545 is ideally suitable for testing and monitoring light intensity. Using the software available as an option, the user can create different measurement sites, and connect individually stored light intensity values to a curve. 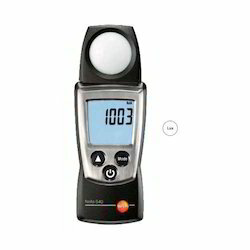 This "light profile" provides information on the regularity of the lighting.With the integrated logger function, up to 3000 measurement values can be stored in the instrument. This allows the user to monitor the light intensity even over a longer period. The measurement results can be printed out directly on site with the Testo fast printer. Looking for Portable Instruments ?